For my part, a 24 hour station clock is a must-have DX-ccessory for any operator. 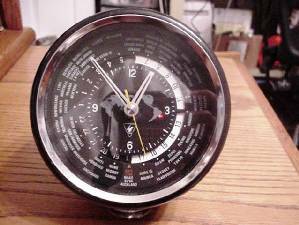 One of my faves is the old QTR-24 World Clock by Yaesu — one which has sat on my radio shack bench-top for about 10 years and offered me awesome hobby service indeed. The QTR-24 is a 12 and 24 hour format clock which was made before I was even born (i.e. around 40 years ago). Normal clock movement (hours, minutes, seconds) on this unique timekeeping device is represented in the classical 12 hour format, while an outer ring depicts time in a 24 hour format. Furthermore, the first 12 hours are shown in white to depict daylight and the other 12 in black. As the name suggests, the QTR-24 World Clock also features a world time read out. Of course, the current name and format for world time, something us DXers talk about all the time and refer to on QSL cards, logging programs, clusters and the like, is called Universal Time Coordinate (UTC). It’s also been known as Greenwich Mean Time (GMT) and the military term ZULU (Z). All world time on the QTR-24 is represented in a 24-hour format based upon the global starting point in Greenwich, England (UK). On the QTR-24, the outer-most perimeter of the clock face has the names of the major cities throughout the world in each of the 24 global time zones. As the 24 hour ring passes a group of cities, you can easily see their UTC time and a day/night indication. I have found this is always a great conversation starter during a QSO with an op on the other side of the world! On this note, the time in any city or time zone can be, at the same time, synchronized with your own local time on a 24 hour basis. After the initial setting, as the clock runs, the Time Zone Hour Disc progresses automatically, thus maintaining the right setting and showing correct time on all indicated locations without any further tweaking. The QTR-24 has three adjustments on the rear. One for time (basic movement adjustments), one for the 24-hour ring, and one for fine-time adjustment. One problem with older type products is the lack of info around to help correct any glitches which occur from time to time. Fortunately, the available documentation on this clock is so good, however, that you can keep it going forever with some simple TLC and some minor fine-tuning every now and then. Since owning the QTR-24, I’ve had only a couple of issues which required attention… When I originally purchased the clock, I found the constant tick, tick, ticking which echoed inside the plastic case to be very annoying. To fix the problem, I wrapped the clock mechanism with some very thin Styrofoam packing and fixed it in place with a tiny bit of sticky tape, leaving openings for the time (Sec ~ adjustment) and the main clock adjustment. I then lined the inner part of the plastic case with one wrap of the Styrofoam, about 2 1/4 inch wide, just enough to dampen the noise from the almost hollow box. This slashed the noise from the clock by nearly 80%. Easy fixed! Just recently, I also noticed that the clock had been losing time — not a great deal but enough to tell me that something was amiss on the inside. As I suspected, years of grease and dust accumulation had slowed the gears to a point where the clock no longer kept accurate time. Moreover, the magnetic movement just did not have the power required to move the gear train. To fix the problem, I simply removed the gears, as well as the shaft where it mates with both sides of the movement case, and cleaned them with a mild solvent to remove the sludge build up. These items are expensive because they are elusive to find in the used market. If you can find one and have a Yaesu theme going in your shack, then this is a terrific acquisition. Most I have seen on places such as eBay have been selling around $100+ in average used condition although I’d expect to pay much more for one in new condition with original box and papers. These are very hard to find. 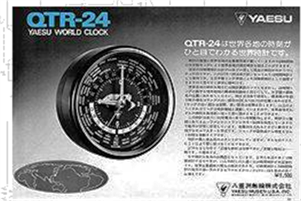 In summary, the Yaesu QTR-24 World Clock keeps great time (the most important factor here), is a very useful for glance reference of current world times, has an easy to read face, and is the perfect size for my ham shack desk. 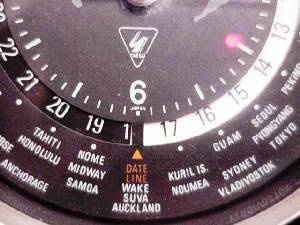 The QTR-24 World Clock is also very cheap to run. In fact, it runs for a year on one UM-2 1.5V battery. Not only does it look good in its plastic black frame and glass case with chrome trim, but it also gives the shack a bit of nostalgia. This is a nice clock. I got in 10 years ago and it is still great. Do anyone have a copy from the Manual? 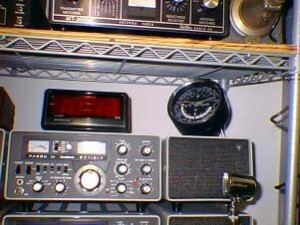 I have a Yaesu QTR-24 clock. Do you have an electronic copy of the manual that you could send me? I can’t seem to find one on line. I have one I found at a thrift store. It works great. I always wanted to know more about this clock though. Your article was well written and very informative. Thanks for putting it out there. I have one of the QTR-24 in excellent condition. Does not have a box. Do you have any buddies that are looking for one? I live in No. calif.
have one…am the orhinal owner…1978/1979……….still working and keeps correct time. Good review buddy, I bought a copy on eBay a few days and I’m looking forward to it and get a closer look. It’s a beautiful and rare example of a time when things were made ​​to last for years and years. Thank you. Very well written article and highly informative. I want to buy one of these and the e bay pricing is very helpful. Maintenance notes and fixes were GREAT. Good job and thanks for the article.